A fifth boy has been rescued from a Thai cave. Media reports say he was brought out of the cave Monday on a stretcher and taken to a hospital. 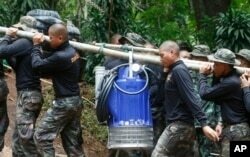 Rescue workers in Thailand relaunched their operation Monday to retrieve the remaining boys and their coach from a cave. Interior Minister Anupong Paojina said the same divers who participated in Sunday’s rescue are conducting the operation Monday because they are familiar with the cave conditions. On Sunday, divers rescued four boys, leaving behind eight boys and their soccer coach. The group has been trapped by floods deep inside a mountain cave for more than two weeks. Loud cheers and euphoria broke out when the acting governor of Thailand's Chiang Rai state, Narongsak Osatanakorn, announced Sunday that four boys had been brought out of the cave. The four rescued boys were taken by ambulance and helicopter to Chiang Rai hospital, where their conditions are described as "not that bad." The children's families have not been told which boys have been rescued. The complicated and extremely dangerous operation to bring the other nine to safety was suspended while rescuers replenish air tanks along the exit tunnel, a job that took several hours. The remaining boys and coach are stranded about 4 kilometers inside the cave. Thailand’s Interior Minister Anupong Paojinda said the same divers who rescued the first group of boys will conduct the next operation because they know the cave conditions and what to do. A truck carrying oxygen tanks arrives outside the Tham Luang cave complex, July 8, 2018. Authorities believe it could be another four days before all are out. But the clock is ticking. Rescuers woke to cloudy skies Monday after several hours of heavy monsoon rains overnight. Thailand’s Meteorological Department said there was a 60 percent chance of rain Monday with thunderstorms forecast throughout the week. 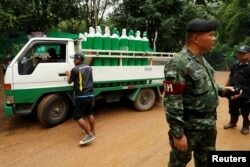 Thai authorities said Monday the overnight rain did not change the water level in cave where boys and coach are trapped. Thirteen divers from around the world and five Thai navy Seals are involved in the rescue operation. They are considered some of the finest divers in the world, but the operation is incredibly challenging even for such experts. None of the trapped boys have ever been diving before; some do not even know how to swim. Two divers are helping each one make his way through very narrow tunnels that twist and turn, and filled with dark muddy water. It takes the divers about eight hours to get into the cave, reach the boys, and bring them back out. The divers also brought out touching notes for the families written by some of the trapped boys. One boy asked for a fried chicken dinner. Another reminded his parents not to forget his birthday party, while a third said he misses his entire family, but described himself as "happy." This July 2, 2018, photo released by Tham Luang Rescue Operation Center, shows the boys and their soccer coach as they were found in a partially flooded cave, in Mae Sai, Chiang Rai, Thailand. The anxiety-filled families say they have forgiven soccer coach Ekapol Chanthawong who led the boys on what was supposed to be an innocent adventure in cave exploring more than two weeks ago. The cave began filling with floodwaters, however, blocking their escape route. It took rescuers nine days to locate the group, and the last week to figure out a way to get them out. The experts say if the boys are not rescued over the next few days, they may have to wait inside the cave for months before the rains ease and another rescue attempt is made. Soldiers carry a pump to help drain the rising floodwater in a cave where 12 boys and their soccer coach have been trapped since June 23, in Mae Sai, Chiang Rai province, in northern Thailand, July 6, 2018. Constant pumping has reduced the water level inside the cave, but new rain could not only re-flood the area, but also strengthen the water currents in the narrow passages though which rescuers and the boys must swim with the help of diving gear to exit the cave. The story of the boys in Thailand has riveted the entire world, including President Donald Trump. "The U.S. is working very closely with the government of Thailand to help get all of the children out of the cave and to safety. Very brave and talented people," Trump tweeted Sunday.